Race Cozy Corner: Super September Sale! Get your wallets ready because the Super September Sale is here! Shop anything from Lazada Philippines—the one stop shopping and selling destination in the country—from September 8, - 10, 2015, and avail of up to 80% off discount on varying products from different categories. You can shop for anything, from laptops, speakers, mobile devices, bags, and even to your baby’s feeding equipment. 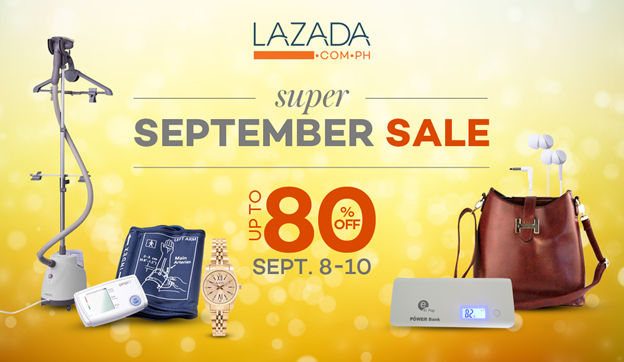 Buy now through http://www.lazada.com.ph/super-september-sale/ or through the Lazada Mobile App, and experience effortless shopping from selecting the products until payment. Don’t worry about not owning a credit card, with Lazada you can pay with cash the moment it arrives on your doorstep. So what are you waiting for? Avail of the great discounts now and join the Super September Sale!